Tactical lights can light up the night with the click of a button. The challenge is that Tactical lights are often bulky and expensive to operate. They make total sense when you work in a tactical environment but in the day to day world, tactical isn't always practicle or affordable. One of our goals at Concealed Comfort is to bring you reliable quality equipment that delivers professional performance without draining your wallet. We believe that the Stylus Pro and Microstream LED pocket flashlights are the tactical solution for the practical person. Each operate off of AAA batteries which are readily availabe and affordable. Stylus Pro and Mircrostream fit easily into your shirt pocket or the watch pocket of your jeans and like your Cell Pal Holster, your equipment is low profile providing reliable Concealed Comfort. Never a reason to leave your gun behind again...never be caught in the dark. PayPal make fast, easy, and secure payments for your purchases! MicroStream® Small enough to fit into your watch pocket - bright enough to light up the room. Impressive! 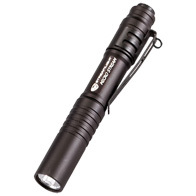 HIGH-POWERED LED PENLIGHT. Streamlight’s new high-flux LED light with Proprietary Micro Optical Systems has "Battery-Booster" electronics to provide a super-bright beam.